In preparation for Bradford’s game with Temiscaming this weekend, Bradford has signed forward Evan Haga to a one year contract. The junior hockey veteran has played three seasons of Junior ‘A’ and one season of Junior ‘C’. Haga, 20, is a native of Pickering, Ont. and stands 6’3”, weighing 183lbs. Evan began his junior career with the Pickering Panthers (OJHL) as a 16 year old. After spending three years with the Junior ‘A’ club; Haga dropped down to Junior ‘C’ and played for the Uxbridge Bruins last season. 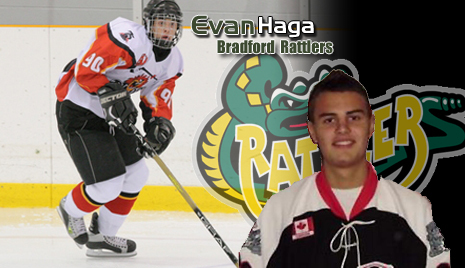 Now, ready to come back to the Junior ‘A’ level, Evan will be a Bradford Rattlers for the remainder of the season. The standout player was amongst the league leaders in nearly every statistical category last season. Haga recorded 38 points (23g, 15a) in just 29 games last season with Uxbridge. He finished seventh in the league total points, fifth in goals, and in the top ten in points per game. Evan is ready for the jump back to Junior ‘A’. Earlier this week, Bradford made the biggest free agent splash of the season; when they signed Rob Sutherland. The goalie was the GMHL’s best goalie last season, and will be making his debut this Sunday against Temiscaming. Bradford continues their drive for the Russell Cup next Sunday (November 13th); when the Temiscaming Titans come to town. The two clubs are far believed to be the favorites to win the league this season and the game should be one of the most skilled games of the season. Temiscaming is a perfect 14-0-0, against Bradford’s 12-0-1. This will be the first match-up these franchises have ever had against each other. This game will mark the debut for both Haga and Sutherland. Come out and support Bradford, Haga, and Sutherland in what promises to be one of the best hockey games of the year!